Bernard Jackman believes that Rob Kearney does not get the credit that he deserves for his consistent performances in an Ireland jersey. Kearney has not been named in the squad that will face Argentina this weekend after he was given a 50-50 chance of returning to fitness after picking up a shoulder injury in Leinster's recent Pro14 win over Treviso. Jordan Larmour will be starting at full-back instead and has been in scintillating form, scoring a hat-trick of tries against Italy last weekend. But while the 21-year-old year might be a major prospect for the future, Jackman says that his Leinster team-mate Kearney still has a lot to offer to Ireland. 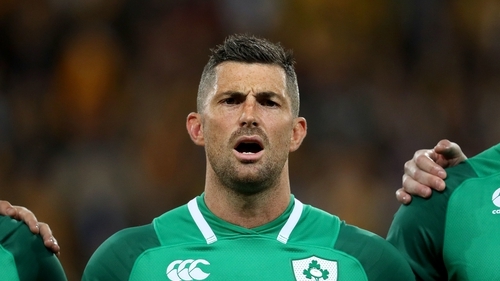 "With the different angles we're lucky enough to get, you watch Ireland play from behind the post angle and you see how important Rob Kearney is," he told RTÉ 2fm's Game On. "His work-rate, his attention to detail, his positioning and his communication. He makes everyone else look good. If you have young wingers in your team, for them to have the opportunity to play with someone like Rob Kearney, he has them on a piece of string really. "And it's so hard for opposition teams to find space because of his intelligence and his work-rate. He makes very few errors and probably doesn't get the credit. "He's not going to score tries like Jordan Larmour did at the weekend but he's a force in attack as well. I think a lot of people appreciate him but he's definitely one of those players that you miss more when he finally hangs up the boots because he's been a key member of this Irish team since 2008 or 2009." Looking at the challenge that Argentina will bring on Saturday evening, Jackman is impressed by the victories they scored over South Africa and Australia in the Rugby Championship. He remains confident that Ireland will eventually come out on top at the Aviva Stadium, but cautions that Joe Schmidt's charges will have to be clinical in order to win. "They're a team who've shown real progress. I think playing at that level in the rugby championship has done them good. They beat South Africa, they beat Australia away and were far from disgraced against the All-Blacks. "They've played some really good rugby and they've obviously got a new coach who's been in France and in Australia with Michael Cheika so [he's] well travelled, understands the modern game. I think we'll win but if we don't perform on Saturday, we'll come unstuck. "It's a proper test match and a really good opportunity for us to get a win against a southern hemisphere team but hopefully fine-tune ahead of the All Blacks."